The Pin is the basic unit of Pinterest. It is the equivalent to the tweet on twitter. Pins consist of an image or video. Pins also include information specifying the board in which it is pinned, the source (either uploaded or taken from the web) and an indication from whom it was repined (if indeed it was). Pinning can be done by clicking the add+ button on the top menu bar. Clicking the add button will give you the option of adding a pin from a website, uploading a pin or creating new board. Pinning can also be done on the fly while surfing the web using the “pin it” (or bookmarklet) button. The “pin it button” can be installed upon registration to the site or later on. To install the “pin it” button visit the pin it button page in the about drop down menu. Pins are organized within boards. The boards themselves are defined by a title and a category. 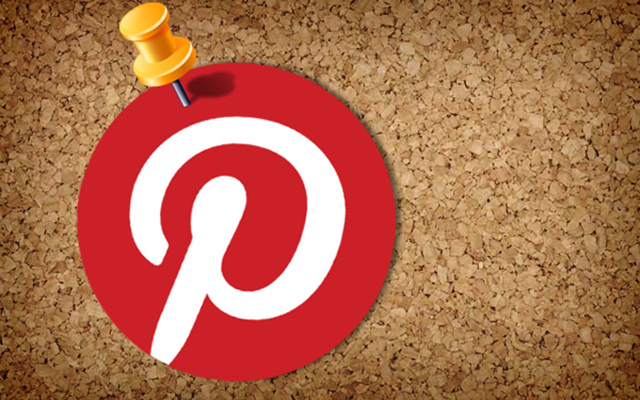 It is important to note that content is proliferated through the Pinterest home feed. The home feed displays pins from pinners and boards which the user is following. Users have the option to follow other pinners or individual boards at a time. Content discovery can occur by exploring the home feed (there is an option to view either followers, categories, everything, popular or gifts) or by running a search. When running a search you must choose to display pins, boards or pinners. Boards are by default public to all users on pinterest, however, you can choose to make a board secret. 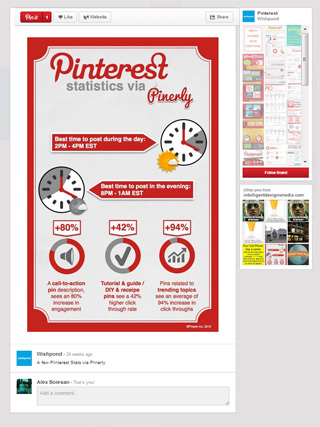 Secret boards are not displayed to your followers or in any search results on pinterest. In fact they won’t be seen anywhere else on the site; they can only be seen by the creator. Users are only allowed to have up to three secret boards at a time. Secret boards can be made public at any time; however, public boards cannot be changed to secret boards once they have been made visible. There is also the option to create collaborative boards. This is done simply by indicating who is able to pin to a board in the edit board menu. Repinning is very easy to understand once you grasp what a pin is. Pinterest is a scrap booking tool and content sharing site. Users can share existing content with their followers by repinning. Repinning allows content to proliferate through the site. Repining is done by clicking the repin button that appears when hovering over a pin. Beside the repin button is the like button. Unlike repinning, liking a pin does not cause that pin to appear in anyone else’s home feed. In contrast to the like function on facebook , the like function on pinterest is not meant to serve primarily as a sharing tool. Instead, it is intended to serve as a sort organizational tool, a way of saving interesting images that do not neatly fit into any existing boards that a user might have. Also, users may want to hold onto images without sharing them with their followers (although liked images do appear in the like folder on user’s profile page). Leverage Pinterest for your Marketing Campaigns with Wishpond’s Pinterest Contest app. Run a Pinterest contest to engage fans to submit and vote on Pinterest boards, on Facebook, Twitter, Websites, and Mobile Devices.